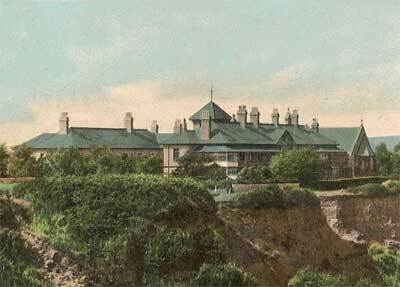 The Home of Rest (now Winchester House) is situated on the cliff overlooking Sandown Bay, near the bridge to Lake over the railway line. The Home of Rest, Sandown road was erected in 1893 by Mrs. Harvey, and presented by her to the Winchester Diocesan Council of the Girls’ Friendly Society; it consists of separate blocks of buildings connected by corridors; the rooms facing the sea open on a verandah, and there is a covered balcony shut in with glass for use in bad weather: the home is intended for women needing change of air after illness or who require a holiday rest, and is available for 73 inmates: a chapel is attached which has a good organ: the institution is in the hands of trustees and under the management of a committee, for the use, not only of the associates and members, but of any women who can bring satisfactory references. 2018, the building is known as Winchester House run by the YMCA.